Although I haven’t read any of Stephanie Perkins other popular releases as soon as I heard her latest creation was set to be a YA horror novel I decided it was one for my TBR. 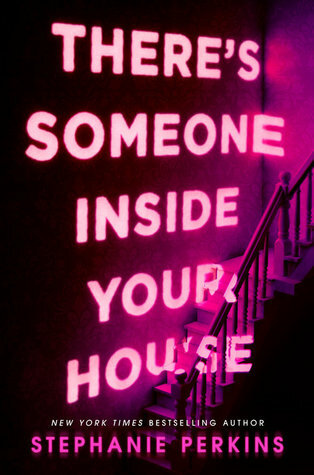 There’s Someone Inside Your House is a teen slasher movie in novel form. With all of the classic ingredients from the small town setting, to gory scenes and a group of teens who run towards dangerous situations rather than away from them, the book is a fast-paced tale created for fans of the genre. Our main character occupying the ‘final girl’ role is Makani Young, a who moved from Hawaii to Nebraska to live with her grandmother following a mysterious incident. We are also introduced to several other characters most notably Makani’s boyfriend Ollie and besties Alex and Darby. The book strays from the usual horror structure as we don’t have to wait until the very end to find out the identity of the killer, and this element seems to have divided opinions amongst readers. Personally I found this to be an interesting idea and liked that despite the early reveal the killer's actions are not clear until later on, meaning there is still something to keep you guessing. Whilst I enjoyed the mystery elements of the story There's Someone Inside Your House just wasn’t as scary or full of suspense as I’d hoped, leaving me slightly disappointed. Having said that, the book was an entertaining read overall and made a day of train travel fly by much quicker! I’m sure many readers will love Perkins' take on the teen slasher and am interested to see if she will explore the genre further in her future books.